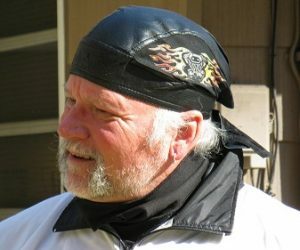 Vol Lindsey is a Poet, Wood Sculptor, Biker and retired Creative Writing teacher living on Route 66 in Gouge Eye, Texas. He was born in 1949 at a Bible college in Waxahachie, but if he has a “home,” it is spread through most of the states in southeast America, mostly Florida and Tennessee. He has degrees in Literature, History and Education, earned at Middle Tennessee State University. Vol Began writing while still in high school and for several years as a non-Haight Ashbury hippie. Like most folks, he gave all that up at the insistence of what folks call “real life.” Twenty-five years later, and thanks to his brilliant wife, Kimberly (R.I.P. ), he got back to his TRUE real life, did some sculpting, picked up his pen, and bought a new bike. Since then, he has read publicly for many years at the various fabulous venues in Nashville, and has been recognized by that city and the State of Tennessee for his contributions to poetry. Oh, yeah, and biked lone wolf all over the damn place as much as health would allow. asleep on the pillow next to mine. Monet, but not Van Gogh at the last end of time. get ready for a last solo. To kindle a wanton despair. How I’ve dared to come this far. And sleep among the rocks. there is time to think.